This USB 3.0 Front panel 2-Port hub bracket for dual 2.5" HDD/SSD to a 3.5" bay is excellent for space saving. Two female USB 3.0 ports at front; supports data transfer speed up to 5Gbs. Lot of two (2) Bytecc 2.5" Dual HDD/SSD Screwless Brackets. 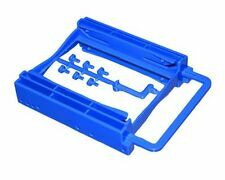 For 3.5" Bay, BRACKET-252 Blue. 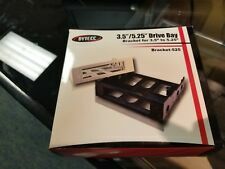 · BYTECC 3.5"/5.25" Drive bay. Manufacturer: Bytecc. Sixteen (16) mounting screws included. Install two(2) 2.5” or one(1) 3.5” HDD into 5.25” bay. Totally screwless, tool less. This Clip-on 2.5" HDD / SSD bracket for internal installation in a Desktop computer. Clip-on style for two 2.5" HDD / SSD. BYTECC 2.5” Dual HDD/SSD Screw Less Bracket. Bytecc BT-M260U3F SuperSpeed USB 3.0 to Sata 2.5" Double Drive Enclosure for SATA HDD/SSD with Firewire Ports. Manufacturer: Bytecc. Non-Raid (USB 3.0 to 2x Sata). Smart Cooling Fan. Easy open and lock door. Manufacturer: Bytecc. USB 3.0 Front panel HUBs with Dual 2.5" HDD/SSD Bracket for 3.5" bay. Easy Connection, one 20 pin USB 3.0 cable for dual USB 3.0 port at front. Two female USB 3.0 ports at front; supports data transfer speed up to 5Gbs. Manufacturer: Bytecc. Totally screwless, tool less. This Clip-on 2.5" HDD/SSD bracket for internal installation in a Desktop computer. Clip-on style for two 2.5" HDD/SSD. Manufacturer: Bytecc. For converting single 2.5" HDD/SSD into 3.5" HDD drive bay. Bracket with handle, fits in 3.5" drive bay easily. Clip-on design, Easy slide HDD/SSD in or out. Part Number: BRACKET-120. Manufacturer: Bytecc. USB 1.1/2.0 adapter interface to ensure high speed performance. Ultra slim design. No external power needed. BRACKET-252K 2.5" Dual HDD/SSD Screwless Bracket For 3.5" Drive Bay Condition: New Manufacturer: Bytecc Part Number: BRACKET-252K This Clip-on 2.5" HDD/SSD bracket for internal installation in a Desktop computer. 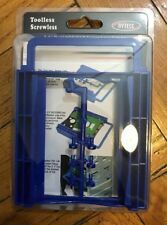 This bracket takes two 2.5" HDD/SSD to be mounted in standard 3.5 inch drive bays without any screws or tools for fastest, easiest installation. Features: Clip-on style for two 2.5" HDD/SSD Totally screwless, tool less Carrying handle for easy inserting/pulling during installation Easy mounting side holes for various desktop computer case Thank you for visiting our store! Manufacturer: Bytecc. Easy open and lock door. Compact construction and light weight design. Tool-less design for HDD installation. Tray-less design. Fast HDD exchanging. Hot swap operation. Plug & Play. Manufacturer: Bytecc. 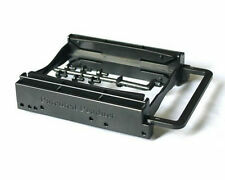 This Internal Mounting kit convert 3.5" drive bay to 2 x 2.5" drive bays for 2.5" Hard Drives. It works with HDD/SSD and includes screws to mount the drive. Bytecc BT-M260U3 SuperSpeed USB 3.0 to Sata Double Drive New. With this kit, you can easily mount your 2.5" hard disk drive and/or solid state drive into your computer case's 3.5" drive bay. Nice! This item is brand new in the original package. The UPC bar code label has been removed from the outside of the package for promotional purposes. This doesn't affect the product in any way. Manufacturer: Bytecc. Support SDHC. Support Windows 98 or above (Windows 7 compatible). Support Mac OS V8.6 and above. Manufacturer: Bytecc. For Mac & PC. Condition: New. For 3.5" Sata HDD. Aluminum case for heat dissipation & durability. Up to 300MB/s data transfer speed. Manufacturer: Bytecc. Non-Raid (USB 3.0 to 2x Sata). Smart Cooling Fan. Easy open and lock door. No Software Installation needed, Plug and Play Storage Policy Operation System Support. USB 1.1/2.0 adapter interface to ensure high speed performance. Ultra slim design. No external power needed. Part Number: 35525. Manufacturer: Bytecc. It works with IDE, SCSI, or SCA drives and includes screws to mount the drive. Universal Mounting screw holes for variety computer cases, rack mounted PC. Lip-on 2.5" HDD/SSD bracket for internal installation in a Desktop computer. Totally screwless, tool less. Clip-on style for two 2.5" HDD/SSD. Carrying handle for easy inserting/pulling during installation. Bytecc BT-M252U3 2.5" Dual-Bay RAID 0/1 SuperSpeed USB 3.0 to Sata External Hard Drive Enclosure. Manufacturer: Bytecc. Hardware Raid 0 (Striping). Hardware Raid 1 (Mirroring). 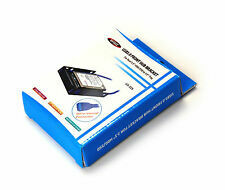 Support Sata HDDs with height 9.5mm or below.